Globally, current dietary recommendations are geared towards assisting consumers choose low fat, low-saturated fat diets that are thought to be beneficial for cardiovascular health. Recommendations have traditionally focused on fat quantity and composition as a means of lowering total cholesterol (TC) and low-density lipoprotein cholesterol (LDL-C), which are independent risk factors for coronary heart disease (CHD) . To achieve these end-points dietary modulations require not just a decrease in fat content per se but a decrease in saturated fatty acid (SFA) and an isoenergetic increase in polyunsaturated fatty acid (PUFA) and/or monounsaturated fatty acid (MUFA). Thus dietary manipulations require a control over the fat composition in the diet by striking a balance between the various fatty acid classes. The food we eat comprises a mixture of both visible and invisible fats and therefore mixtures of fatty acids. The net effect of such a mixture of fatty acids on plasma cholesterol and the different lipoproteins would essentially be the sum effects of all the fatty acids, some acting in opposite directions to each other. It is therefore important to decipher the key cholesterol modulating fatty acids to determine the cholesterolaemic index of the fat or oil consumed. Monounsaturated oils especially olive, which are rich in oleic acid, are currently touted to be among the healthiest of the edible oils in the human diet. The American Heart Association’s (AHA) Step-1 diet for example advocates equal balancing of the saturated, monounsaturated and polyunsaturated fatty acids in a 30% fat energy diet . This has emerged as one of the most quoted dietary recommendations and primarily pursues the goal of reducing overall fat consumption, which in turn is postulated to trigger reductions in plasma lipid-lipoprotein associated CHD risk factors. None of the current commercial oils and fats on their own are able to meet this specified fatty acid distribution. Fortunately, rapid progress has been made in our understanding of fatty acid effects. Understanding the effects of individual saturated fatty acids is complicated by current evidence that they differ in their cholesterol and lipoprotein regulating abilities. An important consideration is not all SFA are equal in their cholesterolaemic effects. Less certain is also the comparative hypercholesterolaemic behaviour of the different oils and fats that are often termed as saturated, yet contain significant amounts of both monounsaturated and polyunsaturated fatty acids e.g. palm oil . Given the variance of fatty acids in the diet, interest in the biological effects of individual SFA on lipoprotein metabolism remains intense. The environment of individual fatty acids in the diet (inter-correlations with other SFA, PUFA and MUFA), their predominance in various oils and fats, the position occupied by individual fatty acids on the triacylglycerol (TAG) molecule and the percentage of SFA in the diet are all important variables modulating lipoprotein metabolism. Predictive equations based on human trials have concluded that individual SFA differed in their cholesterolaemic potentials. Keys  who examined the hypercholesterolaemic nature of saturated fats assumed that lauric acid (C12:0), myristic acid (C14:0) and palmitic acid (C16:0) had equal cholesterol-raising properties. Hegsted et al. found C14:0 to be more cholesterolaemic than C16:0 but C12:0 had little effect or no effect. Medium-chain fatty acids (C8:0-C10:0) and stearic acid (C18:0) were also considered as having little effect or were neutral. MUFA (predominantly oleic acid, C18:1) was speculated to be either neutral or half as potent as PUFAs in lowering blood cholesterol levels . PUFAs, predominantly linoleic acid (C18:2) were estimated to have twice the capacity to lower blood cholesterol as SFAs had in raising them. Meta-analyses have identified C14:0 as the most hypercholesterolaemic fatty acid and its potential has been variously assessed by investigators to be 4-6 times more powerful than C16:0. There is agreement that changes in TC are paralleled by changes in LDL-C and there is also similarity in their predictive coefficients . In addition it was reported that TC:HDL-C ratio decreased with increasing saturation from C12:0 to C18:0. A basis for comparing the capacity of individual fatty acids to modulate blood cholesterols levels was derived from regression coefficients developed through the use of predictive equations. This was calculated as 1% of energy equivalent to 6 g of carbohydrates or 2.7 g of fatty acid for an average man or woman consuming a total daily energy of 2400 kcal (10MJ) . These analyses found C14:0 to be the most hypercholesterolaemic of the saturates. Though the analyses by Clarke et al. found both C12:0 and C16:0 similar in their potential to raise blood cholesterol, the analysis by Mensink and Katan  found C16:0 to be more hypercholesterolaemic than C12:0. Both groups based their study on experiments conducted under metabolic conditions. Clarke et al’s  meta-analysis was based on 134 solid food experiments whereas Mensink et al. worked with 16 studies. Other investigators also found C12:0 to be less hypercholesterolaemic than C16:0 . Early clinical trials did not preclude to satisfactory predictive equations for the effects of individual fatty acids on HDL-C. This was because diet-induced changes in HDL-C were within a small range and within-person fluctuations from day-to-day were relatively large. There is now recognition that fats have the capacity to raise HDL-C. However, the degree to which HDL-C levels are raised is dependent on chain-length and saturation, with the SFAs being most potent, PUFAs the least and MUFA intermediate. Amongst the SFAs, C12:0 and C16:0 were shown to increase HDL-C  but opinion on C14:0 is divided between “…no effect”  and “…positive” [7,8]. Just as C18:0 is neutral towards TC levels, it appears to mediate no effect on HDL-C concentrations . The recent meta-analysis Mensink et al. demonstrated that HDL-C concentrations decreased with increasing chain length of the various SFAs. The TC:HDL-C ratio and found that though C12:0 greatly increased TC much of its effect was on HDL-C. Consequently oils rich in C12:0 beneficially decreased the ratio of TC:HDL-C. C14:0 and C16:0 had little effect on the ratio whilst C18:0 reduced this ratio slightly. TC:HDL-C ratios were also beneficial for C18:1 and C18:2 but significantly less compared to C12:0. A.
Trans fatty acids (TFA) are present in traditional stick margarine, bakery and frying fats, vegetable shortenings, and vanaspati that have been subjected to hydrogenation. They gained prominence and acceptance as a universal food culture by replacing butter and saturated fat as the healthy alternative. TFA are readily reflected in bakery products, fried foods, and breakfast margarine and to a smaller extent in dairy and meat products. Estimates of TFA consumption are very varied and this has been hampered by a lack of an accurate database to reflect their contents in common foods. Indeed, even in the United States and Europe this is a problem since TFA intake is still not featured in their national surveys. Current TFA consumption in the United States is estimated at about 2.6-3.0 energy percent whereas in some Middle Eastern and South Asian populations it may be as high as 7 energy percent. TFA negatively impact human plasma lipoprotein profile and have untoward implications for atherogenesis. TFA deleteriously affect lipoproteins by increasing TC, LDL-C, lipoprotein Lp (a) and decreasing HDL-C relative to their cis isomers . This has raised the need to replace hydrogenated fats with natural solid fats in a large number of food formulations. The nutritional efficacy of the solid fats replacing hydrogenated fats should be such that they do not adversely affect plasma lipids and other CHD risk factors. The cholesterolaemic effects of TFA have been ranked intermediate to the saturated fatty acids and the neutral or mildly hypocholesterolaemic cis-monounsaturates. In addition it has been suggested that these deleterious effects of TFA do not occur when sufficient amounts of 18:2 are available in the diet . Direct comparison of TFA with palm oil (16:0-rich), LM (12:0+14:0) and cis 18:1 by Sundram et al.suggested a ranking order for the ability of these fatty acids to raise LDL-C as follows: TFA>12:0+14:0>16:0 = cis18:1. Furthermore, differences between TFA and 12:0+14:0 were not significant and the response of 16:0 was identical to cis18:1. These detrimental observations of TFA have been reinforced by outcomes from several population studies, which fortify the overall conclusion that TFA increase relative risk for coronary heart disease. There is also mounting evidence that TFA have adverse impacts on diabetic risk for the general population . Based on these findings and a review of all available published literature relating to TFA, the Institute of Medicine (IOM) of the National Academies of Sciences, USA  has declared that there are no data available to indicate a health benefit from consuming TFA and an Adequate Intake, Estimated Average Requirement, and Recommended Dietary Allowance are not established for TFA. Resulting from this expert recommendation and the mounting evidence against TFA, there is currently an urgent race to reformulate many solid fats TFA-free. Interesterification is currently viewed as an alternate process to partial hydrogenation of edible oils and fats. The process involves the randomisation among all three stereospecific positions of fatty acids in native edible oils and fats by either enzymatic or chemical catalysis at low temperatures. The positional distribution of fatty acids on the glycerol backbone are altered either through fatty acids switching positions within a TAG molecule or between TAGs. If interesterification involves TAG species within the same dietary fat, the fatty acid composition remains the same. A solid fat is often interesterified with a liquid oil and in this case fatty acid composition of the interesterified product will differ. Randomised fats have diverse applications both in the food industry and in clinical applications [12,13]. Interesterified fats and oils developed for the food industry have different melting and crystallisation properties from that of native fats and oils which confer desired rheological properties to bakery and confectionary products . The metabolic effects of randomisation of fats has not been extensively studied as the development and use of structured fats is only recent and in the nascent stage. Three recent reviews in this area indicate that literature is confined to mostly animal studies with piglets and rats as models [12-14]. Human studies are few and apart. In contrast increasing citations on the use of structured lipids in the catabolically stressed state is now apparent. Of prime interest is whether structural differences arising from the positional distribution of fatty acids, between randomised and native fats, alters their nutritional behaviour as regards lipid metabolism and gene expression. Given the interest in studying structural influences on digestion, absorption and transport of TAG, methodological preferences favour the postprandial model in current literature. The effects of chemically modified vegetable oils, either from partial hydrogenation or interesterification were compared with a natural oil rich in saturated-monounsaturated fatty acids in a recent human clinical trial (unpublished data, Sundram et al. 2005) All three fats were matched to reflect similar plasticity. The primary focus was on blood lipids and the lipoprotein profile in normocholesterolaemic humans, with a secondary focus on blood glucose and insulin using a postprandial approach. 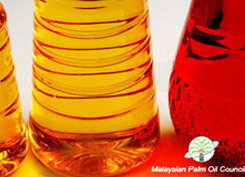 Palm olein (POL) was chosen as the natural fat, as it is widely consumed and used extensively for many solid fat formulations. Partially hydrogenated soybean oil (PHSO) and chemically randomised fat (IE) were included as typical examples of modified fats commonly used in solid fat formulations. After 4wk intervention with the respective test diets, HDL-C and LDL-C was the only lipid parameters significantly affected by dietary treatments. Plasma HDL-C was significantly lower both during the PHSO and IE diet treatments compared to POL. PHSO and IE elevated the LDL/HDL ratio. Thus, strong evidence suggested that these effects were attributable to the composition of test fats. Furthermore fasting blood glucose was increased significantly in the IE group and fasting insulin values were significantly lower after PHSO and IE compared to the control POL period. Postprandial glucose also rose significantly after 6h following the IE meal. This led to the conclusion that both PHSO and IE fats distort the metabolism of lipoproteins and glucose relative to a natural semisolid fat of similar consistency when fed to humans under identical circumstances. Given the heath issues related to excess saturated fat consumption, the need to reduce or eliminate trans fatty acids and the uncertaininty that prevails with the use of interesterified fats, the choice of a healthy solid fat formulation remains and unresolved challenge. What is obvious is the fact that a natural fat would in all respects be a far wiser choice. For African and Asian populations that are on the brink of increased disease burden from coronary heart disease and diabetes manifested by changing dietary and lifestyle patterns, this issue actually takes on great urgency. Since none of the commercial oils and fats currently available is able to meet such optimised dietary requirements, the answer may lie in the use of natural blend fat formulations. Examples of such health blends fashioned on the American Heart Association’s Step1 dietary recommendation  is already a commercial reality and may be looked upon as the primary basis to fashion healthy solid fats of this millennium. 1. Expert Panel. Report of the National Cholesterol Education Program Expert Panel on detection, evaluation, and treatment of high blood cholesterol in adults. Arch Intern Med 1988; 148: 36-69. 2. AHA Scientific Statement: Summary of the scientific conference on dietary fatty acids and coronary heart disease. J Nutr 2001; 131: 1322-1326. 3. Sundram K, Ravigadevi S, Tan YA: Palm fruit chemistry and nutrition. Asia Pac J Clin Nutr 2003; 12: 355-362. 4. Keys A: Coronary heart disease in seven countries. Circulation 1970; 41:1162-1175. 5. Hegsted DM, McGandy RB, Myers ML, Stare, FJ: Quantitative effects of dietary fat on serum cholesterol in man. Am J Clin Nutr 1965; 17:281-295. 6. Yu S, Derr J, Etherton TD, Kris-Etherton PM: Plasma cholesterol-predictive equations demonstrate that stearic acid is neutral and monounsaturated fatty acids are hypocholesterolemic. Am J Clin Nutr 1995; 61; 1129-1139. 7. Mensink RP, Zock PL, Kester ADM, Katan MB: Effects of dietary fatty acids and carbohydrates on the ratio of serum total to HDL cholesterol and on serum lipids and apolipoproteins; a meta-analysis of 60 controlled trials. Am J Clin Nutr 2003; 77: 1146-1155. 8. Mensink RP & Katan MB. Effect of dietary fatty acids on serum lipids and lipoproteins: a meta-analysis of 27 trials. Arterioscler & Thromb 1992; 12: 911-927. 9. Clarke R, Frost C, Collins R, Appleby P, Peto W. Dietary lipids and blood cholesterol: quantitative meta-analysis of metabolic ward studies. BMJ 1997; 314:112-117. 10. Institute of Medicine (IOM). Letter report on dietary reference intakes for trans fatty acids. In: Dietary reference intakes for energy, carbohydrate, fiber, fat, fatty acids, cholesterol, protein and amino acids. Institute of Medicine/Food and Nutrition Board. 14pp. www.iom.edu/fnb. National Acad. Press, Washington, DC (2002). 11. Sundram K, Ismail A, Hayes KC, Jeyamalar R, Pathmanathan R. Trans (elaidic) fatty acids adversely affect the lipoprotein profile relative to specific saturated fatty acids in humans. J Nutr 1997; 127: 514S-520S. 12. Kubow S. The influence of positional distribution of fatty acids in native, interesterified and structure-specific lipids on lipoprotein metabolism and atherogenesis. J Nutr Biochem 1996; 7: 530-541. 13. Hayes KC. Synthetic and modified glycerides: effects on plasma lipids. Curr Opin Lipidol 2001; 12: 55-60. 14. Hunter JE. Studies on effects of dietary fatty acids as related to their position on triglycerides. Lipids 2001; 36: 655-668. 15. Sundram, K., Perlman D, Hayes, KC. Increasing the HDL level and HDL/LDL ratio in humans with fat blends. United States of American Patent No. 557 8334, 1996.